The Buffalo Bills and Denver Broncos traded the lead multiple times in the first half, as the Bills got a touchdown pass from QB Tyrod Taylor to WR Andre Holmes and the Broncos saw a rushing touchdown from RB Jamaal Charles. The field goal kickers got a work out in this contest as well, as both teams added two field goals each and head to halftime 13-13. While the Broncos would initially take the lead again with an early third quarter field goal, the Bills would close the game on a 13-0 scoring run. TE Charles Clay caught a touchdown pass and they would add an additional two field goals to win 26-16. With that, we give you our PFF exclusive takeaways from the contest for each team. Taylor was under constand pressure (as expected), as the Denver rush affected him on 16-of-34 drop-backs. While he took four sacks, he didn’t make any mistakes with the ball and was able to use his feet to make big plays, finishing with a passer rating of 88.2 when under pressure. When he had a clean pocket he was nearly perfect, completing 15-of-17 passes for 127 yards and two scores, posting a passer rating of 137.0. McCoy wasn’t effective in the run game (he averaged just 1.86 yards after contact per carry), but he was very effective as a receiver out of the backfield. He caught all seven balls thrown his way, against six different Broncos, gaining more yards after the catch (49) than gaining from scrimmage (48). Gaines was phenomenal. He had 12 passes thrown into his coverage and yielded just four receptions for 39 yards, while also grabbing an interception. 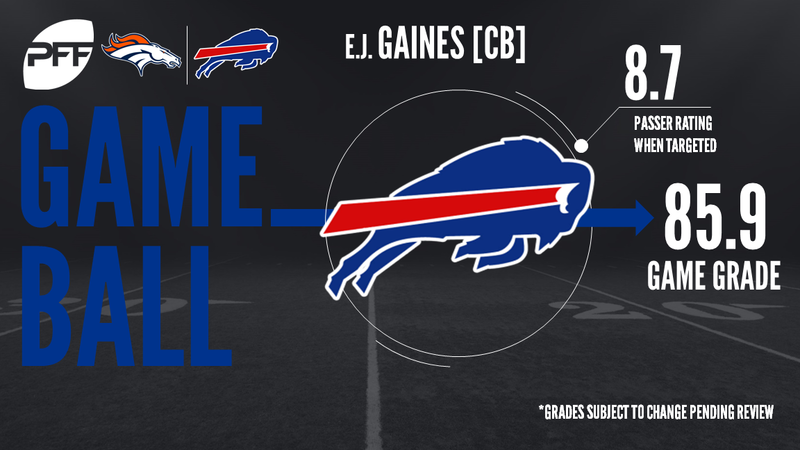 Gaines had multiple pass breakups in coverage and saw just an 8.7 passer rating when targeted. Humber tallied three stops in run defense, giving the Broncos blockers all they could handle on the interior. Humber finished with a 16.7 percent run stop percentage on his 18 run snaps. Siemian finished the game 24-of-40 for 259 yards against Buffalo, as he was sacked three times and threw two costly interceptions. When under pressure, he finished 2-of-8 for 28 yards and an interception for a passer rating of 2.9 under duress. Rookie tackle Bolles was a bright spot for Denver. Bolles surroundered only one charged pressure while doing fine work in run blocking. Bolles excels at double team blocks and he managed to open up some pathways for the Broncos running game. After posting a sack on the first offensive play of the game, Miller actually had a mild day on the pass-rush by his standards, as several of his five remaining pressures for the game were unblocked due to scheme. However, he was extremely effective on runs, as he notched four run stops, second-best on the afternoon for the Broncos. It was Todd Davis who led the Broncos in total defensive stops with six, and he also managed to notch a sack. Not surprisingly, his 87.8 run defense grade also led Denver’s efforts.